St Brigid’s Primary School in Cloughmills are firmly in celebration mode as their girls camogie team have just been crowned Antrim All-County Indoor Champions for 2015! The school has a roll of 63 children for this academic year. That includes only two primary seven girls and four primary six girls meaning that to gather a panel of eight players for the indoor competitions the help of some primary five girls was needed. You might think that this meant these girls wouldn’t have much of a chance coming up against much larger schools. It has turned out to be quite the opposite! In November the girls went to Cross and Passion College, Ballycastle and took part in the North Antrim Allianz Cumman na mBunscol indoor camogie competition. Against all the odds they came back to Cloughmills victorious after hard fought games against teams like St Patrick’s Loughgiel and St Patrick’s and St Brigid’s Ballycastle. The girls were overjoyed and so was everyone at the school. This was not to be the end of the journey. On Tuesday 10th March the girls had the privilege of going to the Ballymena North Recreation Centre to represent North Antrim at the All- County Finals. After having trained hard all winter the girls knew they would be against some very tough opposition but as usual they brought their ‘never say die’ attitude. 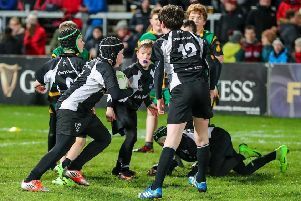 They played other winning teams from regions around Antrim including Bunscoil Phobal Feirste, Gaelscoil na bhFál, and Glenravel Primary School. Despite having three very close and hard fought matches, the girls emerged victorious in each one. They played brilliantly showing they have skill and determination in abundance and the girls were eagerly cheered on every step of the way by a troop of dedicated parents who also made the trip. When the presentation came, up stepped the twin Magills to lift the trophy that marked St Brigid’s Cloughmills as county champions for the very first time in its history! Brid and Bronach, the only two primary seven girls were instrumental in guiding the team through some very tough matches. They were ably assisted by the very talented Katie Molloy and sharpshooter Anna McKillen. Catherine Doherty and Ashdyn Patterson both shone and worked tirelessly when they were called upon in mid-field. On their return, the whole school lined the perimeter fence of the school and gave a rapturous welcome back to the champion girls. These girls, from such a small school in the rural village of Cloughmills, deserve huge credit for this achievement. For the girls involved and everyone at the school, it is a day that will never be forgotten and a trophy which will be very welcome to remain in St Brigid’s. The girls will now progress to represent Antrim as they challenge to become Ulster Champions. The journey continues!